Last year (when I bought this pattern) I thought that it would be just the perfect addition to my wardrobe. This year - I'm not so sure. It's the Alice and Olivia peasant blouse the red one. I did pull the elastic at the neck a bit tighter than prescribed - felt like the neck edge would fall of my shoulders at the least hint of movement. The waist is on a drawstring - seems to me that it would be better with elastic, having the ties only for show. The fabric is rather slippery, especially as "spaghetti strings" - I can just see having to retie that bow at the waist at least every 15 minutes. I'm not crazy about the casing in the sleeves - it's just a tuck inside. Makes the flounce hang in a "different" fashion to what I've come to expect. As I look at the picture - no, actually, as soon as I put the pants under the blouse on Dummy, I thought that there might be hope for this blouse. It's one of those items that I really have to wear for some hours before I can really decide if I like it or not. Just standing in front of a mirror to see if something fits, doesn't really truly tell you if something is comfortable to wear. For me, comfortable is something that I don't have to think about the whole time it's on me. Some minor changes might have to be made. Something tells me that tomorrow night's beginners' sewing class is not the right time to try out this blouse - I pretty well have to be a whirlwind at those classes, just to make sure that no-one goofs too badly. Now - lounging around someone's backyard with wine glass in hand - that's more the appropriate time. No, I had no intention of copying Gail, but I also decided to sew shirts. It was still too cold to really get into "summer sewing", but the long sleeves make these imminently more wearable at this time of year. Vogue 2634 and McCalls 5433. In some ways similar, in some ways not. The McCalls is more fitted, due to the vertical darts, so I suppose if I wanted to make it a blousier fit, I could just omit those. The white print is the McCalls. The gold is Vogue. Both fabrics are voile, though the gold is much crisper than the white. McCalls has a sewn-on front band. The Vogue is simply turned under twice at the front edge. Much faster to turn under a straight edge and press it down than sewing and topstitching a separate band. So - if speed is crucial - Vogue wins. I quite definitely prefer the McCalls - it's wider, easier to place and sew the buttonhole. I prefer the McCalls, which ends flush with the edge of the opening. That cuff extension always bothered me - looks a little too homemade? There is not too much of a difference in the width of the cuff, but the two buttons do make the cuff sit more neatly on the wrist. a long bar tack across all the raw edges. I do think that this needs rethinking. Perhaps next time (and there will, I'm sure, be plenty more next times) the sleeve could be redrawn to place the seam at the underarm. A placket sewn on to avoid those nasty raw edges. It's too cold to really get excited about summer clothes. I'm definitely sick of the winter woolies, though a certain number of them does get pressed into service to keep me warm enough to function. Thought I'd work on items that can get worn now, because I'm all about instant gratification - sew and wear. 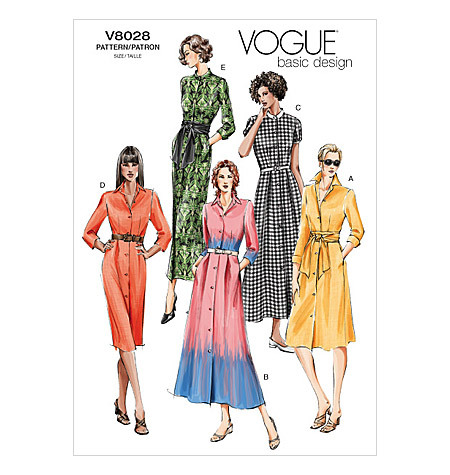 Another shirt dress - this time it's Vogue 8028. Seems it's OOP, but still available. I made this up a few years back, so no surprises in the fitting department. The fabric is a rayon challis that my sister-in-law bought to make a skirt. I managed to squeek out the dress, but no collar and only three-quarter length sleeves. The belt is a rather ancient one that I made many years ago, in suede. Nothing terribly inspired about this dress. It's pretty well "out of the package". Sometimes that's the way it is. It does work rather well with the jacket that I made a while back, that also has three-quarter sleeves. It's difficult to pair necklines with this jacket. A regular collar looks dumb, so I'm rather happier with just the standing collar. Of course I put pockets in the side seams. Now I can jam my hands into those pockets when I shouldn't be waving them around. And, of course. a little snap at the waist to keep everything in place and lined up.